Definition at line 44 of file msgqueue.h. Definition at line 83 of file msgqueue.h. Definition at line 84 of file msgqueue.h. Referenced by MsqGetDownKeyState(), MsqInitializeMessageQueue(), NtUserGetKeyboardState(), NtUserSetKeyboardState(), UpdateKeyState(), UpdateKeyStateFromMsg(), and UserGetKeyState(). Definition at line 92 of file msgqueue.h. Referenced by CaretSystemTimerProc(), co_IntDestroyCaret(), co_IntFixCaret(), co_IntSetCaretPos(), co_UserHideCaret(), co_UserShowCaret(), MsqSetStateWindow(), NtUserCreateCaret(), NtUserGetCaretPos(), and NtUserGetGUIThreadInfo(). Definition at line 77 of file msgqueue.h. Referenced by co_IntProcessMouseMessage(), co_MsqInsertMouseMessage(), MsqCleanupMessageQueue(), and MsqInitializeMessageQueue(). Definition at line 89 of file msgqueue.h. Referenced by co_MsqInsertMouseMessage(), MsqCleanupMessageQueue(), MsqInitializeMessageQueue(), and UserSetCursor(). Definition at line 50 of file msgqueue.h. Referenced by IntSetFocusMessageQueue(), and MsqDestroyMessageQueue(). Definition at line 80 of file msgqueue.h. Referenced by co_MsqPeekHardwareMessage(), MsqGetMessageExtraInfo(), and MsqSetMessageExtraInfo(). Definition at line 59 of file msgqueue.h. Referenced by co_MsqPeekHardwareMessage(), MsqCleanupMessageQueue(), MsqInitializeMessageQueue(), MsqPostMessage(), and MsqPostMouseMove(). Definition at line 87 of file msgqueue.h. Referenced by co_MsqInsertMouseMessage(), MsqInitializeMessageQueue(), UserSetCursor(), and UserShowCursor(). Definition at line 53 of file msgqueue.h. Definition at line 54 of file msgqueue.h. Definition at line 72 of file msgqueue.h. Referenced by co_IntProcessMouseMessage(), co_UserSetCapture(), MsqSetStateWindow(), NtUserGetGUIThreadInfo(), and ProcessKeyEvent(). Definition at line 74 of file msgqueue.h. Definition at line 70 of file msgqueue.h. Referenced by co_IntProcessMouseMessage(), MsqSetStateWindow(), and NtUserGetGUIThreadInfo(). Definition at line 61 of file msgqueue.h. Definition at line 56 of file msgqueue.h. Referenced by MsqInitializeMessageQueue(), ProcessKeyEvent(), UserProcessKeyboardInput(), and UserSendKeyboardInput(). Definition at line 55 of file msgqueue.h. Referenced by co_IntProcessMouseMessage(), co_MsqInsertMouseMessage(), and MsqInitializeMessageQueue(). Definition at line 52 of file msgqueue.h. Referenced by co_MsqPeekHardwareMessage(), and MsqCleanupMessageQueue(). Definition at line 76 of file msgqueue.h. 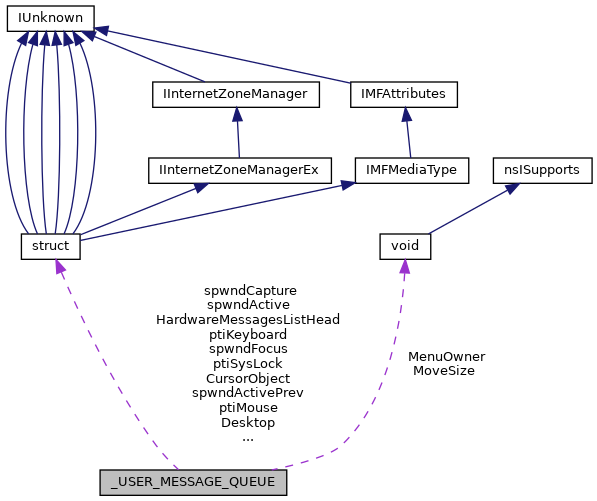 Referenced by co_IntSetActiveWindow(), co_IntSetForegroundMessageQueue(), co_MsqInsertMouseMessage(), co_UserSetCapture(), IntReleaseCapture(), IntSendFocusMessages(), MsqDestroyMessageQueue(), MsqWakeQueue(), and ProcessKeyEvent(). Definition at line 47 of file msgqueue.h. Definition at line 67 of file msgqueue.h. Referenced by co_IntProcessMouseMessage(), co_IntSendActivateMessages(), co_IntSetActiveWindow(), co_IntSetForegroundMessageQueue(), co_UserSetFocus(), co_WinPosActivateOtherWindow(), DefWndHandleSetCursor(), DoTheScreenSaver(), IntActivateWindow(), IntFlashWindowEx(), IntSendFocusMessages(), MsqSetStateWindow(), NC_DoNCPaint(), NtUserGetGUIThreadInfo(), ProcessKeyEvent(), UserGetActiveWindow(), and UserGetForegroundWindow(). Definition at line 68 of file msgqueue.h. Referenced by co_IntSetActiveWindow(), and UserSetActiveWindow(). Definition at line 63 of file msgqueue.h. Referenced by co_IntProcessMouseMessage(), IntGetCapture(), IntGetCaptureWindow(), MsqSetStateWindow(), and NtUserGetGUIThreadInfo(). Definition at line 65 of file msgqueue.h. Referenced by co_UserProcessHotKeys(), co_UserSetFocus(), IntGetThreadFocusWindow(), IntSendFocusMessages(), MsqInitializeMessageQueue(), MsqSetStateWindow(), NtUserGetGUIThreadInfo(), and ProcessKeyEvent().